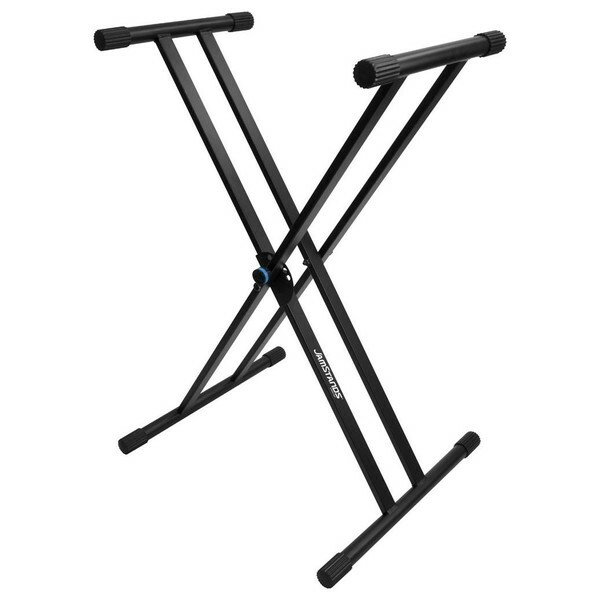 The Ultimate Support JamStands JS-502DC X-Style Keyboard Stand, brings a new level of innovation. Offering a range of five height settings for sitting-to-standing playing comfort. The JS-502DC features Ultimate Support's patented memory lock system and unique stabilising end caps, giving keyboardists time-saving, onstage luxuries along with peace of mind. The JamStands JS-502DC holds true to Ultimate Support's twofold commitment, providing uncompromising instrument stability along with innovative design. The JS-502DC supports keyboards, synthesizers, and workstations up to 125 lbs with superb strength and stability, while maintaining the convenient, lightweight X-style format that gigging keyboardists demand. With thick, double-braced steel tubing, a generous upper keyboard shelf, and a no-glare matte finish, the JS-502DC is the cure for the common X-style stand, equally at home onstage, at jams, and in the studio.